The Beatitudes (Matthew 5:1-12) are identified as the essential teaching of Jesus. Recorded in Matthew, within the larger section of the Sermon on the Mount (Matthew 5-7) they have always been taken seriously in the life of the Church but along a line ranging from literal to metaphorical, from concrete pragmatic directives to poetic unrealistic hopes of how heaven is. They present an inherent tension between now, and what is to come. But will we live it only in the future, or already today in the here and now? Justice. It’s a hot topic for us these days. #metoo #blacklivesmatter The recent Brett Kavanaugh Senate Vote Debacle. The notions of himapthy, conversational safety, white fragility and religious freedom. It seems that in our current polarized culture, justice is the eyes of the beholder. What can be justice for one person is lamented as injustice for another. It’s almost as if justice is a zero-sum game of winners and losers. In the text, the word [dikaiosuné] can be translated into English at both righteousness and justice, with the emphasis that it comes from God and brings us into God’s reality. We’ve inherited our cultural notion of justice across time and cultures. First personified in the Egyptian goddess MAAT, justice was the force that created order out of the primordial chaos. The Greek titaness THEMIS and her Roman version of JUSTITIA give us the vision of justice as a woman, carrying a sword, and scales (first used by MAAT) personifying divine order and natural law. It’s the vision we often see outside of our courthouses. In the Bible, justice comes from God and moves us toward and with God. It’s God’s desire for us to be whole as both individual creatures and a common creation. It’s in that sense that Rev. Dr. King Jr. pronounced that “injustice anywhere is a threat to justice everywhere”. There is a link between ourselves – each other – all of creation – and God. Different philosophers have seen justice as both crucial and also subjectively important. Plato thought it was the paramount virtue which established rational order. Aristotle was more nuanced thinking that justice is the mean between committing injustice and suffering it, since the one is having more than one’s share, while the other is having less. Hobbes thought that it was an artificial virtue necessary for social order, and thus a strong state (government) was necessary to provide it, as each individual wanted a different justice. Today we talk about justice – and hear this passage – with two diverging connotations. First, we may hear it as primarily about personal integrity, being right with God. Or we might hear it as the pursuit of universal social, economic, racial and political justice that God demands of us. Righteousness is often associated with the private practice of doing good (or God’s word); whereas the word justice is connected with a global responsibility to make sure that everyone lives in right relationship with one another, all of creation, and God. The meanings seem opposed, or divorced from one another. In fact, justice is divorced between thinking and acting, between epistemology (how we form and justify our beliefs) and practical morality (informing our private and public behavior). 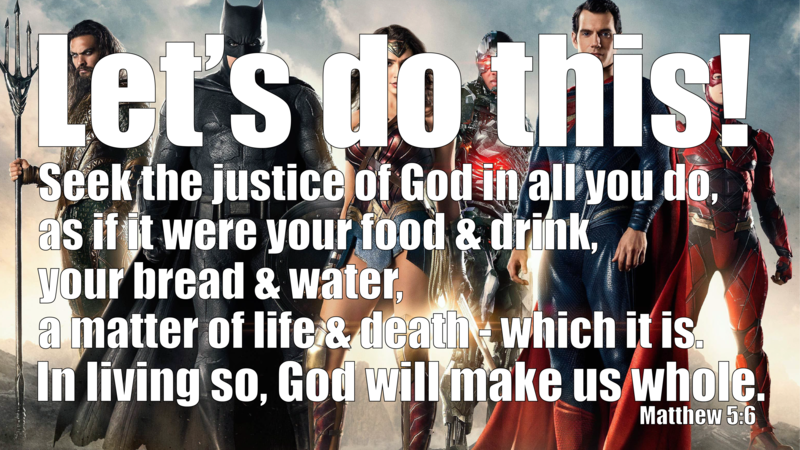 But here Jesus is talking about a justice that makes the whole whole. Which word do you prefer for the idea of God’s wholeness: justice or righteousness? Why? The parable in Luke is of an angry woman who won’t let up in asking and advocating for justice (possibly similar to the women in the elevator with Senator Flake). How do you react to anger in the expression of justice or the pleading for it? What is Jesus saying about justice in this parable? How and when have you experienced justice? injustice? How did that experience move you closer to the heart of God? How have you participated in bringing about justice? How did that experience bring you further into God’s presence and/or made you more whole? What does this parable mean for the way that you – us – live today?